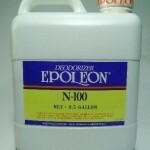 PRODUCT DESCRIPTION: Epoleon N-100 was developed mainly for extra-strength deodorization of neutral odors in wastewater treatment and scrubbers. It completely dissolves and neutralizes gases which include acidic odors (Hydrogen Sulfide, Methyl Mercaptan) and alkali odors (Ammonia, Trimethylamine). N-100 is therefore effective odor control agent for Pet urine, Dead Rodents, and musty smells in bathrooms, laundry areas, cabinets and basements. N-100 is not only strong but also environmentally safe, and it is USDA approved. 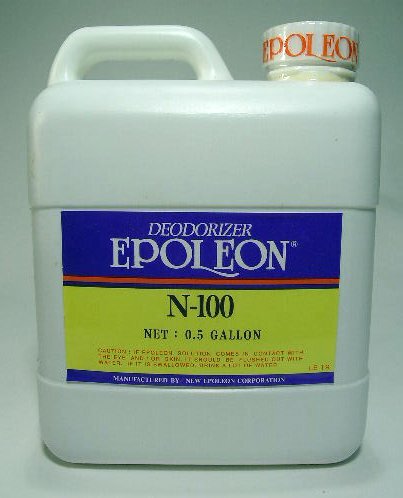 N-100 will also eliminate spray tank odor when added to pump sprayers, back pack sprayers and large spraying systems used to apply insecticides, fungicides, herbicides and more. Add 1/2 to 1 oz per gallon of water to remove unwanted scent. MIXTURE RATE: 6-12 oz per gallon of water. Each gallon can treat 400-800 sq/ft of surface area. Porous surfaces like cement, dirt or mulch will require more spray so expect to get 400-500 sq/ft on such areas. Inside the home, carpeting and tiled floors will require less material so expect to get 600-800 sq/ft of coverage per gallon.